Karim Benzema denied he got lucky for his Champions League final goal against Liverpool. Real Madrid striker Karim Benzema opens the scoring against Liverpool. 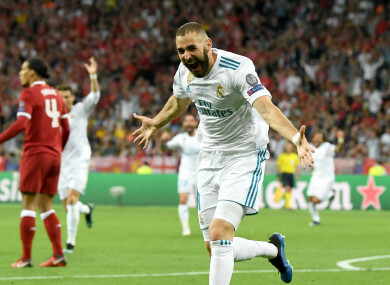 REAL MADRID STRIKER Karim Benzema claimed his Champions League final goal against Liverpool was not lucky. The Frenchman capitalised on a Loris Karius error to open the scoring in Kiev as Real Madrid won a 13th European Cup courtesy of a 3-1 victory. Benzema intercepted a Karius throw, sticking his foot out before seeing the ball roll into the bottom corner. Speaking to Kuwaiti television, Benzema – who was left out of Didier Deschamps’ squad for the World Cup in Russia – believes good fortune did not play a part. “My goal from Kiev, it was not a matter of luck,” he said, via AS. Email “Benzema claims Champions League final goal was not lucky”. Feedback on “Benzema claims Champions League final goal was not lucky”.